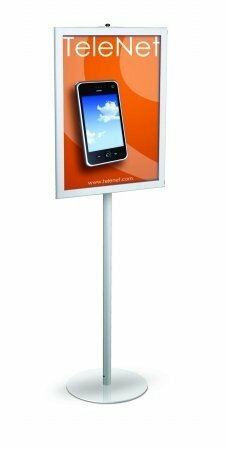 FSP331S Color: Satin Silver, Frames: 1, Holds Graphic Size: 24" x 36" Features: -Perfex signframes. -Sleek aluminum mitered frame. -Solid security base bushing. -Top entry slot. -Made in USA. -Handsome satin finishes. Material: -Aluminum. Loading: -Front. Mounting: -Free Standing. Orientation: -Portrait. Sign Holder Type: -Pedestal Base. Country of Manufacture: -United States. Product Type: -Sign Holders. Dimensions: -1.5" diameter x 66" tall pole. -13" Round. Holds Graphic Size 22" x 28" - Overall Height - Top to Bottom: -67.5". Holds Graphic Size 22" x 28" - Overall Width - Side to Side: -23.25". Holds Graphic Size 22" x 28" - Overall Product Weight: -18 lbs. Holds Graphic Size 24" x 36" - Overall Width - Side to Side: -25.25". If you have any questions about this product by Testrite, contact us by completing and submitting the form below. If you are looking for a specif part number, please include it with your message. Monster Signholders Color: Satin Silver, Size: 24" x 36"
Monster Signholders Color: Satin Silver, Size: 22" x 28"